THE volunteer lifeboat crew from Lough Swilly RNLI have been honoured with a Marine Ministerial Letter of Appreciation for Meritorious Service. The award recognises the "professionalism and courage" shown by the crew during a harrowing search and recovery mission for five members of the same family who drowned at Buncrana Pier in March. Fanad man Davitt Walsh who saved the life of a baby - the only survivor of the accident that night - was honoured at the same event with a bravery medal. Lough Swilly RNLI was represented at the awards ceremony at Farmleigh House by lifeboat operations manager John McCarter, coxswain Mark Barnett and deputy launching authority Eunan McConnell. 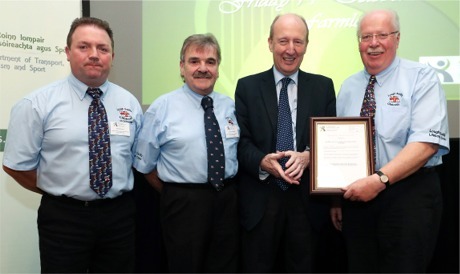 Receiving the Marine Ministerial Letter of Appreciation for Meritorious Service from Transport, Tourism and Sport Minister Shane Ross at Farmleigh House, Dublin, are Lough Swilly Lifeboat members, from left, Mark Barnett, Eunan McConnell and John McCarter. The local RNLI, whose all weather lifeboat is located at Buncrana Pier, was among the first emergency services on the scene as night fell on March 20, 2016. They recovered the five casualties from the water off the slipway and administered casualty care onshore. Sadly, however, all five casualties were pronounced dead a short time later. Minister Ross praised the "courageous achievements and service of this group of brave Irish men and women who have faced crises and dug deep, offering their skills and in many cases placing themselves in danger in order that others might be safe on our waterways". Crews from Kinsale and Castletownbere RNLI in Co Cork were also awarded a Marine Ministerial Letter of Appreciation.